Seriously. I get to see amazing things when I’m working with people -- not just in how they look on the outside, but in who they are -- what shines from within and glows through their expression. They say our eyes are windows to our soul. I’m not sure I realized how deeply I believed that until I became a photographer. More often than anything else, the characteristic people tell me they notice in my work is genuine expression and soul in people’s eyes. That being said… this girl, Sarah, is… extraordinary. Gaze into her eyes for a moment and you’ll see what I mean! I’ll get to how much I adore her personality in a moment, but because this is a blog about photography, I have to start for a moment with a few technical admirations (is that a word?). I have learned a LOT over the years about posing. Posing for different body types, clothing styles, symmetry or asymmetry in people’s faces, men’s bodies, women’s bodies, children’s personality… I’ve taken classes, practiced, read countless articles, worked with hundreds of people, I’ve tried and failed, I've learned how to connect with and to direct my clients, and I’m absolutely still learning new things on every single shoot. What’s amazing about working with Sarah is how natural she is in front of the camera. I looked back at photos from our first session together -- before I had much of the education and experience that I have now -- and realized how much she has taught ME, through what she does naturally. So THIS shoot -- a few years later -- was beyond satisfying. And I think the pictures show it well. You may remember a few weeks ago I posted a blog with a sneak peek behind the scenes of this session. 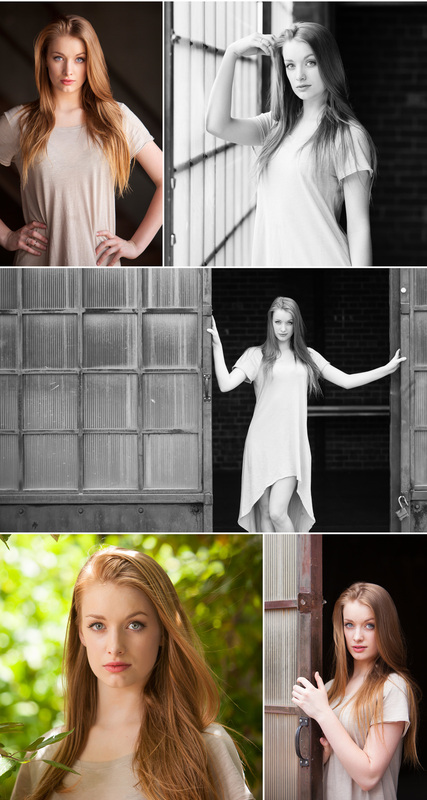 We photographed at two different Denver locations (three if you include the bonus pictures in the alley at the end). Blanc, a converted barn/warehouse space in Denver, was our first location. Typically a wedding venue, this space was AH-MAZ-ING for portrait work (if you’re a photographer in Denver, you can have access to Blanc as part of your membership to The Studio -- more about this amazing group of women in another upcoming post!) Beautiful light, fantastic textures, the kind of vintage materials that are authentically vintage -- weathered through use and age -- all made for incredible backgrounds for Sarah’s portraits. We had a blast exploring the light, playing with posing, composition and learning more about the possibilities of this unique location. After finishing up at Blanc we headed to downtown Denver, where we photographed inside the colonnade at the Byron White Courthouse. I’ve wanted to photograph portraits here since touring the Courthouse during a Doors Open Denver event. This row of columns is magnificent on it’s own, and the simple dress that Sarah wore was PERFECT to highlight her beauty in this powerful setting. Seriously, she looked like a Greek goddess in here! Oh right! And after all this, we still weren't quite ready to stop shooting... so one last set of photos in the alley before we stopped for a celebratory gelato!